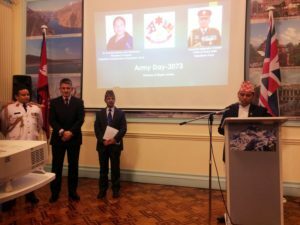 The Embassy of Nepal in London hosted the annual Nepal Army Day event on Monday 27th February 2017. Invited guests on the occasion included various Defence Attachés, personalities associated with Nepal and members of the Brigade of Gurkhas (BG). Lieutenant General Nick Pope CBE, Deputy Chief of the General Staff and Colonel Commandant Brigade of Gurkhas, attended the function as the chief guest. He was accompanied by Colonel James Robinson, Colonel Brigade of Gurkhas. The event commenced with an opening speech by the Nepalese Defence Attaché, Colonel Pradeep Jung KC. The Colonel Commandant Brigade of Gurkhas delivered a speech with particular emphasis on the enduring relationship that exists between the Nepalese Army (NA) and British Army, and the NA’s enormous contribution to the UN’s peace-keeping missions worldwide. General Pope said that he had met the Chief of the Army Staff, General Rajendra Chhetri during his recent visit to Nepal and that the Nepalese Army Chief might visit the UK in due course. 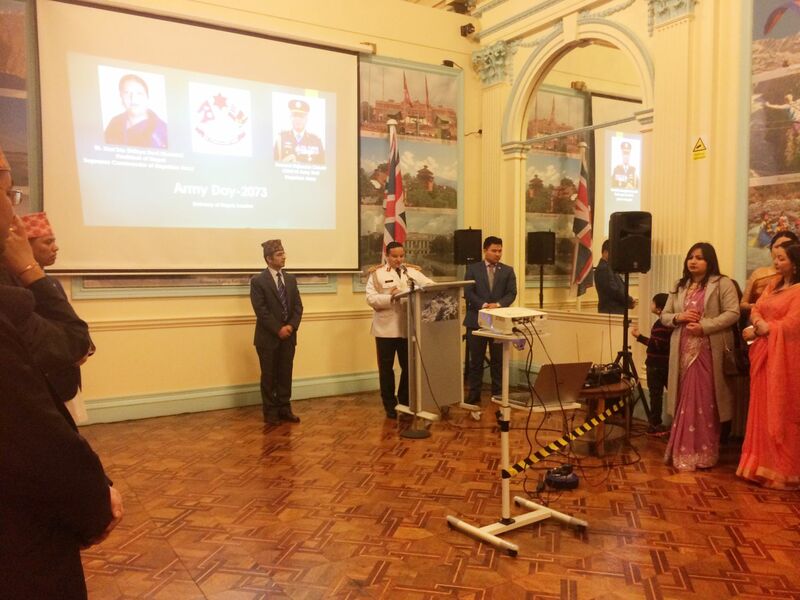 The Ambassador of Nepal to the UK, HE Dr Durga Bahadur Subedi also gave a speech thanking all those present on the occasion. He made a special mention of the Nepalese Army’s rich heritage and professionalism as a first rate organisation. 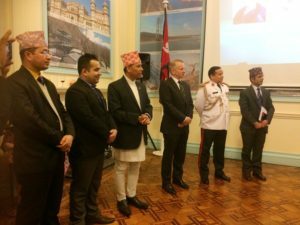 Dr Subedi said that the bicentenary of the Gurkha service was a crucial milestone in the bilateral relations of the two countries and that a week long event was being organised in March in the Embassy to mark this special occasion. He invited all to come and take part in the celebration. Other attendees from the BG included Headquarters Brigade of Gurkhas Staff Officers and Gurkha Majors from the British Army Gurkha unit. The function ended with a typical Nepalese cultural dance in which both Colonel Commandant and Colonel Brigade of Gurkhas participated.